To say we were a tad flabbergasted that Modern Warfare 2‘s 5 map pack DLC costs $15 is about right. We weren’t exactly outraged. It’s just a video game after all and really doesn’t matter that much. But $15 is a bit much for five maps with two of the recycled from previous Call of Duty games. Infinity Ward’s Creative Strategist Rob Bowling disagrees. He calls it an investment. Well, Creative Strategist is just code for Public Relations so he kind of has to say that. A lot of people think they should be getting the old maps for free. Don’t you think 1200 MSP is a little bit expensive for what is essentially three new maps? I have no doubt that anyone who downloads this map pack is going to get their money’s worth. They’re going to feel their investment is worthwhile. 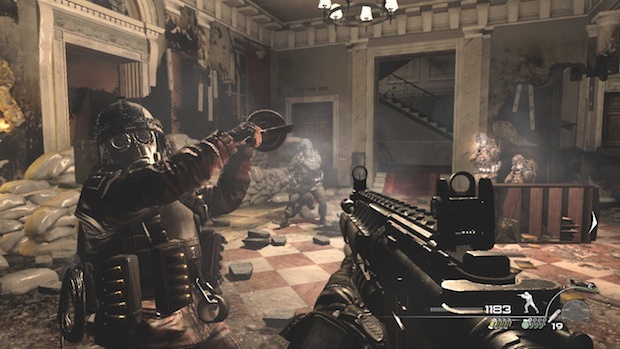 Because if you’re playing Modern Warfare 2 like myself or many other people do every night, that’s actually going to give you a bunch of new mileage and a bunch of extra gameplay – to really explore and discover them and to really, you know, come up with new tactics and experience them in a whole new way. Regardless of what the price is you’re going to feel your money’s well-spent.